Karaṇas, the most fascinating subject in the field of Indian dramaturgy, enjoy the attention of scholars. A karaṇa is described as the joined motion of hands and legs. (Hasta-pāda-samāyogaḥ Nṛttasya Karaṇam Bhavet) Such karaṇas are enlisted in the fourth chapter of Nāṭyaśāstra written by Bharatamuni and the chapter itself is named as Tāṇḍava lakṣaṇa. There are one hundred and eight karaṇas starting from Tala puṣpapuṭa to Gaṅgāvataraṇa are described in the chapter. Karaṇas are made by Cārīs (movements) and Hastas including Nṛtta hastas. Abhinavabhāratī, the commentary to the Nāṭyaśāstra is seen as the guide to reconstruct the Karaṇas. The same list in sculpture are found in Tañjāvūr Bṛhadīśvara temple, Cidambaram Naṭarāja temple, Kumbhaghoṇam śārṅgapāṇi temple, Tiruvaṇṇāmalai temple and some of them in Vṛddhācalam and Triuvadikai. Though the karaṇas are found from the period of pallavas, the series of them are found only during the period of Coḹas. Tañjāvūr has the earliest set of them in the upper portion of the sanctum. There are eighty karaṇas in the set while others are left with blank rocks. 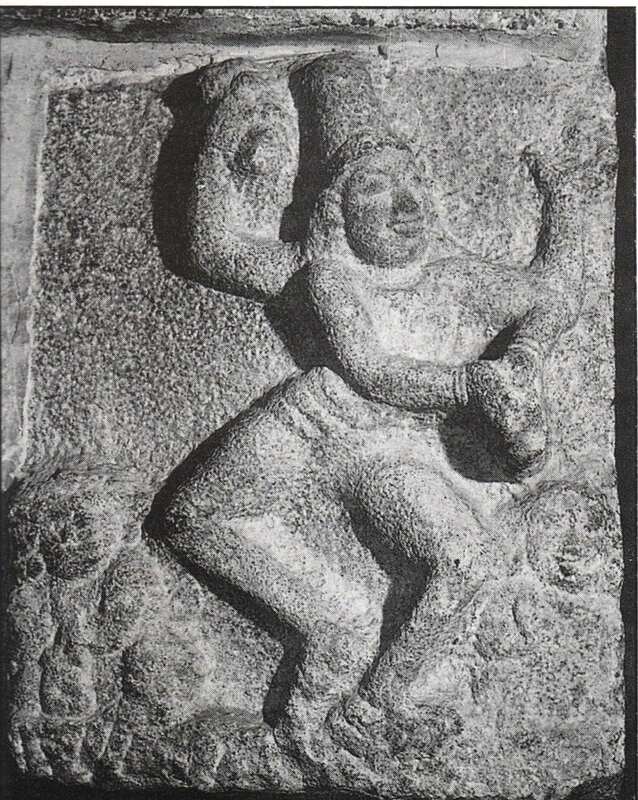 The figure of four handed Parameśvara is depicted as the performer. As was suggested by Dr. V.Raghavan, these sculptures are the flash point of the last moment of the karaṇas. I got a surprise by seeing the view of Dr. R.Nagaswamy, which stated that there must be a south Indian version of commentary for Nāṭyaśāstra by which the Tañjāvūr karaṇas were made since I guessed this conclusion a year ago. Some of the karaṇas violate the prescription of Abhinavabhārati are the clear evidences for this conclusion. But Abhinavabhāratī can be used as a guide to rebuild the karaṇas since the south Indian version is not available today. Now we can see the karaṇas of the temple. This very first karaṇa is depicted in the first panel. Lord śiva is depicted with four hands were the rears have ḍamaru and fire. The lower hands are united like a flower cup (Puṣpapuṭa) by which the name of the karaṇa arises. His right leg in Agratala position and his hip is in Sannata position As Dr.V.Raghavan suggested, the Vyābhugna kaṭi is very neatly depicted. All these depictions follow the description in Nāṭya śāstra. The left side should be in Puṣpapuṭa, leg will be in Agratala sañcara and the side should in Sannata position. This is called as Talapuṣpapuṭa. The joining for two Sarpaśiras is termed as Puṣpapuṭa. Lifting the heel and placing the toe with all fingers is called as Agratala sañcara. Making the abdomen concave and bending in the side is called as “Nata” pārśva. Adhyardhikā cārī is prescribed for this karaṇa which ends en agratala sañcara pāda. I think pūrṇadhikā should be done since Abhinavabhārati says dakṣiṇapāda niṣkramaṇa. The vyāvartana should be done at the right and Parivartita should be done in the left. At the end, the hands will be united in the Puṣpapuṭa position. Here we can see the end position i.e the union of hands like puṣpapuṭa. The right leg is in agratala sañcara which urges me to think that pūraṇardikā cāri may be used after which agratalasañcara leg is very easily shown. Iconography Bharata, Bharata natya, Brihadiswara, Chari, Dance, Hasta, Karaṇa, Natya, Sastra, Tala Pushpaputa, temple, Thanjavur. permalink.